Music of Hanukkah. The Gay Men’s Chorus of Washington, D.C. 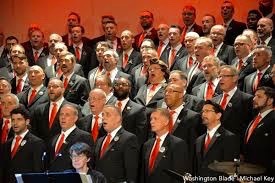 Gay Men’s Chorus of Washington DC. Internet photo. There isn’t much Hanukkah music out there that I am not familiar with, but Jean Bredin, Blogfinger staff, came up with this You Tube treat for the Festival of Lights by the Gay Men’s Chorus of Washington, DC. It is quite superb, and the hand clapping, although not unusual in pop music, is less common in choral pieces. So here is the Hanukkah music that I never heard before, but it is a fine addition to a limited repertoire.